Welcome to the re-launch of Autograss Review's online magazine - or rather magazines as, to acknowledge the fact that we're increasingly covering more than just NASA Autograss, we intend to split our content between two titles, Autograss Review and the new Grass Roots Racer. We're still hoping to re-launch the printed magazine at some stage in the future - so thanks to our loyal subscribers and advertisers in waiting for this to happen. But as our current workload means that this won't be in the near future, we'll concentrate for a while on bringing our online coverage up to date. As "news" stories tend to appear very quickly these days on social media, and then disappear just as quickly, we'll be concentrating on coverage of individual race meetings, and we'll continue to give priority to the smaller club events that other media usually overlook. Our photo galleries from events we attend will be combined with more detailed reports and reviews - click on the photos below for full coverage from each event. We'll be aiming to clear the backlog from the 2015 season as quickly as possible, so please bear with us. Initially it will be just our own coverage, but if any other budding reporters and photographers are interested in contributing content from your own local clubs or promotions, we'd be interested to hear from you. COMING UP ..... DECEMBER 5th & 12th .... We're down to the last two scheduled events of our 2017 "grassroots" racing season. December 5th sees the last running of the annual Westcountry Videos Open at STANDLAKE ARENA, an event that tradiionally sees a few autograss cars joining in with the Standlake regulars (no special permission needed!). 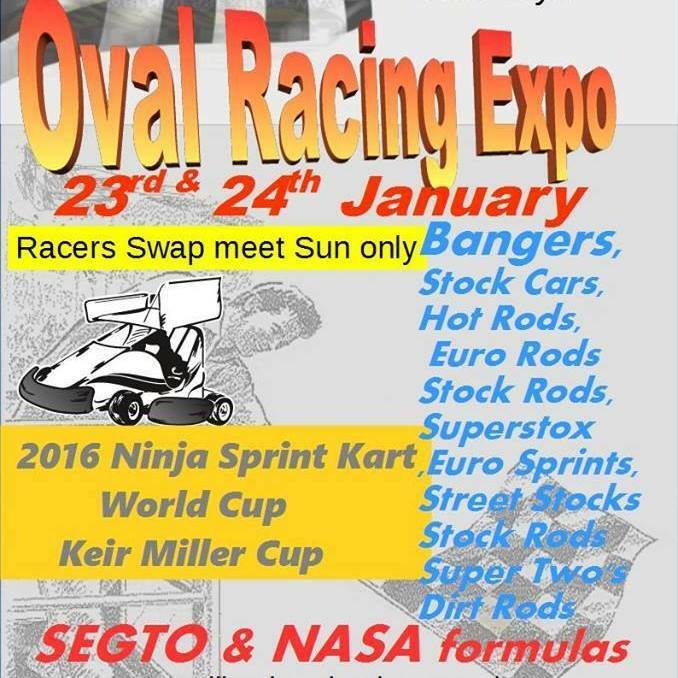 A week later on December 12th, ANGMERING OVAL RACEWAY stages another of its regular winter season events. CHRISTMAS/NEW YEAR EVENTS .... WATERFORD RACEWAY will stage their annual St Stephen's Day event featuring all the Hot Rod classes as well as the annual Destruction Derby ... TRENT AUTOGRASS are proposing a repeat of last year's successful "Cold Turkey" meeting, the suugested date being 30 December .... The 2018 season kicks off on New Year's Day with the DONAL O'BRIEN MALLOW FUNSPRINT in association with McNamara Motorsport, at Watergrasshill, Cork .... Back in the UK ANGMERING RACEWAY also have a New Year's Day event. Please check the links below for our report and photo galleries of the very special season opener at the Waterford Raceway on 19 February, followed by what turned out to be regular visits throughout the season. There's also coverage of Irish Hot Rod racing at TIPPERARY RACEWAY, BALLYSHANNON and BALLYMURN. Other links below will take you to our coverage of the All Ireland Autograss meetings at CARLOW, CAUSEWAY, CORK and MALLOW, the Irish Fastest Person on Grass at WEST WATERFORD, the opening and closing meetings at INVICTA KENT Autograss, the BAS opener at MALLOW, Autograss at PENHOW and CAMBRIDGE, the Stock Hatch and F600 Nationals at YORKSHIRE DALES, the East Midlands open at PENNINE, SEGTO Championship racing at TONGHAM, SEGTO and open Hot Rod events at the OVAL RACEWAY ANGMERING, SEGTO and Rolling Thunder Show racing at ARENA-ESSEX, the New Year Sprint at Watergrasshill, Autosport International, the Oval Racing Expo and the erarly and late season meetings at Standlake Arena. Coverage will be coming soon of the two NASA National Championship meetings but in the meantime we recommend you to check out the photo galleries by Andrea at absnapshots.co.uk and Nick at mirrorboxstudios.com. Please note that photo links below should take you to the event coverage; the other boxes are placeholders for links that we hope to update soon but we keep running out of time! - coverage will be posted soon! ARENA -ESSEX - coverage will be posted soon! ALL IRELAND AUTOGRASS FINALS - coverage coming soon. Sorry for the delay! 19/20 AUGUST 2017 - LADIES' & JUNORS' NATIONALS- coverage will be posted soon! coverage will be posted soon! 5/6 AUGUST 2017 - NATIONAL AUTOGRASS-CHAMPIONSHIPS - coverage will be posted soon! 22/23 JULY 2017 - ALL IRELAND AUTOGRASS SERIES @ CORK - coverage will be posted soon! 9 JULY 2017 - ANGMERING SCOTT WEST MEMORIAL ROUND 2 - coverage will be posted soon! 8 JULY 2017 - ROLLING THUNDER SHOW ARENA-ESSEX coverage will be posted soon! 6/7 MAY 2017 - ALL IRELAND AUTOGRASS SERIES @ CARLOW - coverage will be posted soon! 29/30 APRIL - BRITISH AUTOGRASS SERIES @ MALLOW - coverage will be posted soon! We received the worst possible news just after Christmas when an accident during a Ladies' race at the St Stephen's Day meeting at the Waterford Raceway claimed the life of the club's devoted and universally loved secretary, Mairead D'Arcy. Mairead was rightly regarded as the heart and soul of the Waterford Raceway (better known to Irish racers as "The Pike") and her personality and dedication to her local racers played a major part in making The Pike such a special and enjoyable place to go racing. When we paid an unannounced visit to The Pike in the summer we experienced at first hand how Mairead's smiling, welcoming and helpful presence made such a difference to every racer's and visitor's day at this historic track. Having been brought up in a family who had all made a massive contribution over the years to the Waterford Raceway, Mairead loved her racing and was known for her ability to get into a great variety of cars and get the best out of them, whether in ladies' races or competing against the men. In November she'd raced for the first time at the Tipperary Raceway (Rosegreen) and came away a winner. However, it's not just the racing world that will feel Mairead's loss. As a devoted early years teacher, she'd recently realised a dream with the very successful opening of her own school, "Maud's Little Learners" in her home village of Stradbally, Co Waterford. To the D'Arcy family, the racers and supporters at Waterford Raceway, to everyone on the Irish racing scene who'd been touched by Mairead's influence, and to all in her local community, we offer our heartfelt condolences. Where has the magazine gone? Thanks to everyone who's enquired after the magazine since our last printed issue, no 190, came out in August 2012. Thanks also to our subscribers and advertisers for your patience. We haven't given up on it, but our current workload, both in Autograss and in the "real world" isn't allowing us time at present to make firm plans to re-launch the mag. You are visitor number since we last remembered to reset this counter!